Last night I cracked open the Shadowrun 5th Edition (SR5) book for about a half hour read before wandering into my dream land filled with dragons, knights, cherries, princesses and funny pastel coloured oompa loompas. I have to say two things about this particular chapter (not that I am even close to finishing it). Firstly it has some great topics and pointers in it. Secondly, I do not agree with a lot of it! I can see that whomsoever did the writing for this chapter has put a great deal of effort into it. They have thought a lot about the material that they are going to include and they have worked along a plan to achieve this. It starts with some general advice on how to write a campaign and it is here that the content and I started to drift apart. The book says that to run a campaign the first thing you should come up with is a hook. Agreed by me, I thought we were on the same length at this point in time. But the very next thing is it says to plan out the end of the campaign. Work out what is happening at the end and actually design the run that will bring it home. Um, excuse me? This is one of the worst things you can do to run a campaign. Sure, plan an end how you think it might evolve and write out a sentence to cover it but design the entire run? What happened to players having an effect on their world? By designing the run up front I will have to manhandle that herd of cats that I call players all the way to that end point. I will possibly need to build a railroad (being Shadowrun it is probably a dilapidated monorail) that does not have any branches to get those damn cats where I need them to. They go on to say that if you do not plan the end of the campaign that it is likely to become some wishy washy too long type thing that will just vanish in the annals of time as oops another campaign that never reached its end. They also then try to apply formula to the construct of how you should run one offs vs. campaign runs based on how a TV show runs their seasons. I am sorry, but what are these people thinking? Sure, the campaign may not be tight and constrained like a series of CSI but it is a roleplaying game. I like the fluidity and I prefer to insert my one offs where they will be appreciated more by the players rather than by some TV show scheduling. Past this the section abruptly ends on writing campaigns. They throw some alternate campaign ideas at you but I found it very incomplete. 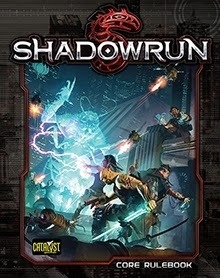 I have to say that SR5 in my mind is really aimed at experienced Shadowrun players rather than inviting new people to the game because they do not really cover the basics of a basic run ANYWHERE in the book. They just expect you to know it all already. I have moved into a section that is detailing threats in the three worlds of SR5 (Magic, Matrix, Flesh) and there are some good ideas in there although it does tend to automate a lot of the material where there is more room for some experimentation. Still, I will keep reading and hopefully they will ease my mind in the near future with some great additions to the chapter! Until next time, keep rolling! Next Post: The Hand of God!